Photo by June Glenn Jr. 1946. 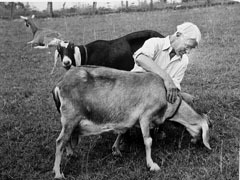 Carl Sandburg spent the last 22 years of his life in residence on a dairy goat farm and published more than one-third of his works while living there. Carl Sandburg (January 6, 1878 – July 22, 1967) was an American writer and editor, best known for his poetry. He won three Pulitzer Prizes, two for his poetry and another for a biography of Abraham Lincoln. Carl Sandburg’s nickname for his wife was Paula. Lilian Paula Sandburg, was famous as well, for her goats. She called her animals the Chikaming herd, and it included Nubians, Saanens, and Toggenburgs. Mrs. Sandburg’s goat breeding program produced champion goats and led to the improvement of goats as milk producing animals. She ran a commercial dairy on the Connemara Farm, Flat Rock, N.C. At its peak, the Chikaming herd had about 200 goats. 1960- Jennifer II, Chikaming Toggenburg doe, sets world record for milk production with 5,750 lbs. of milk in ten months. 1964- Paula Sandburg receives award for outstanding service to the dairy goat industry. 1967-The same year that Carl Sandburg died, the Chikaming herd was dispersed.